A challenge is a special task that appears in the Challenges & Contests section of your Gamestar Mechanic workshop. Challenges are similar to Quest episodes in that they may require you to play, repair, or build games, but they aren’t part of the Gamestar Mechanic storyline. However, they still grant rewards for playing or for designing certain predesigned games and templates. 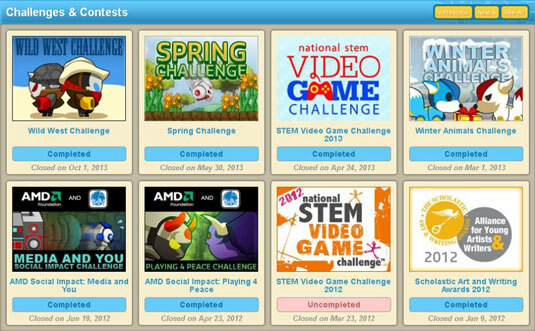 The Challenges & Contests section contains, as its name implies, both challenges and contests. Contests are made available only once and provide the opportunity to submit your games in a competition with other designers, giving valuable real-world rewards to the winners. Usually, only one or two contests are available at a time. An available contest says Enter Now! below it, whereas a challenge says Earn Rewards!. To participate in a challenge, click on the image or the title and read the details of the mission. 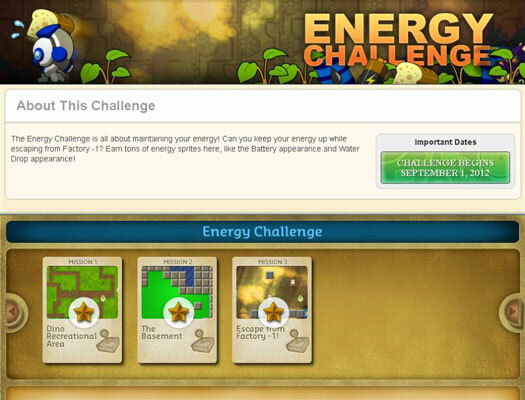 You can access the challenge itself by scrolling to the bottom of the page. Just like the quests, challenges contain individual missions in which you must play, repair, or design games. By completing all the missions, you finish the challenge and reap the rewards. Because you can complete challenges in any order, you can collect the sprites you want ahead of time and complete the other challenges as you need them. However, don’t let seasonal opportunities pass you by; if a challenge is closing soon, be sure to complete it if you can. The Challenges & Contests section of your workshop displays incomplete available challenges first so that you can use them to determine your progress in challenge completion.